If you want to buy my lampwork beads, it is always best to check out my online store and visit the "Emma's Art Beads" section. However, keep an eye on my website for my regular giveaways and auctions too. Regular readers will know that I occasionally auction beads here as well as selling through my online store. Why? Well firstly it's fun. Auctions have a certain energy that fixed-price selling just doesn't have - they can be really fun! Secondly - it makes sense. If I use auction sites to sell my beads, most of my bidders tend to be you lovely folk anyway. So I might just as well run the auctions from here as anywhere else! Thirdly - I know sometimes you have trouble finding sets available. The auction gives an extra method to nab yourself some EJR art beads. Please scroll on down to The Small Print to see how these auctions will be run before emailing me your bid ! A collection of orphan lampwork beads, worked with various silver glass and co-ordinating accent beads - click on the picture to see a larger version. 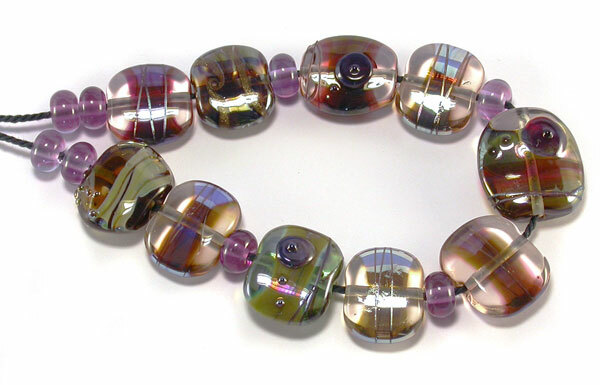 This set of beads is just a collection of testers and experiments really - playing around with silver glass. The largest focal bead measures 22 x 20 mm to give you an idea of size. All the beads have been kiln annealed and cleaned and remember - worldwide insured shipping is INCLUDED on my auctions. So if you win, your winning bid is all you pay - no extra! So get your bids in for this eclectic set of beads and don't let someone else nab them for a steal! I am starting this auction with a very low start price, but there is NO RESERVE! So if you fancy these beads, just email me your bid! But remember - if you don't actually bid, someone else could get them for a song! And what's more... unlike my online store bead sales, worldwide insured shipping is INCLUDED on my SRA lampwork bead auctions. So if you win - your winning bid is all you pay. Email me the highest price you are prepared to go to and I will do the rest, bidding on your behalf against any other bidders on my book. To avoid disappointment, PLEASE BID EARLY. You would be amazed how many people forget to bid until after the auction has finished! If bids are received even a minute after the auction ends, they won't count. Email me your highest proxy bid (all bids in Great British Pounds please!) and remember postage and packing worldwide is included on these beads - so if yours is the winning bid, that's all you pay. No extra for shipping - wherever in the world you live! Good question. I want you to trust these auctions will be run fairly and squarely. But, also I am very aware that many of you value your privacy when bidding on beads. If you want to bid, just email me your highest proxy bid. (This is the maximum amount you are prepared to pay - remember, you could win the beads for less though!). I will email back your bidder number (Bidder 1, Bidder 2 etc) and bid anonymously on your behalf. Imagine you want to bid on a set of beads currently at £10. You email me your highest proxy bid of £20. I will bid for you, bidding as low as I can to outbid any other bids on my book up to your proxy amount. So if Bidder 1 has set their proxy maximum at £15, your bid would go in at £16 and you would be the current highest bidder. If two bidders proxy the same amount, the earliest bid received will take precedence. But how can I trust you Emma? Frankly you can't definitively. However, you can't trust mainstream auction sites entirely either, since it is easy for rogue sellers to set up bogus ID's and shill-bid up their own auctions. I can only give you my word that I will run these auctions completely fairly. However, I know that the vast majority of my customers like anonymity when bidding, so I do intend to honour that. I feel we all know each other well enough now to trust one another. But this is all a work-in-progress don't forget. We will just try it all this way and see how things pan out! Your bid will include postage and packing for the auction, worldwide. SO whatever your winning bid is - that is all you pay. UK Bidders may pay by cheque or Paypal. Overseas customers Paypal only. Please wait for my Paypal invoice once the auction ends and I have confirmed you are indeed the final highest bidder.